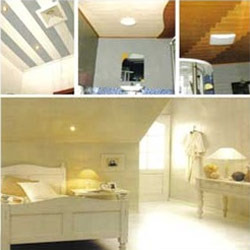 We are a leading Manufacturer of pvc false ceiling from Cuttack, India. We are among the foremost company involved in manufacturing, supplying and trading an extensive range of PVC False Ceiling. These products are highly cherished in market due to their advanced quality and perfect finish. These are extensively used in offices and homes and also enhance the decor of the surroundings. Moreover, we also guarantee to offer our products in a given time frame.